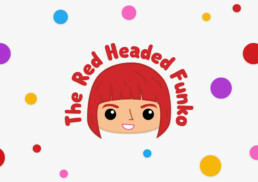 A YouTube identity design came in recently for Sam (aka The Red Headed Funko) who has found her fame showing and reviewing Funko Pops with an impressive collection of over 250. Sam has reached over 900 followers (now over 1000) within a couple of months and felt a proper identity would help form her channel. Along with the logo and identity, I also created an introduction animation. View her channel here, where you can also see the mini ident in action.